Are You Struggling with Your Juggling? Have you ever had one of those days when it seems like you are meeting yourself coming and going? 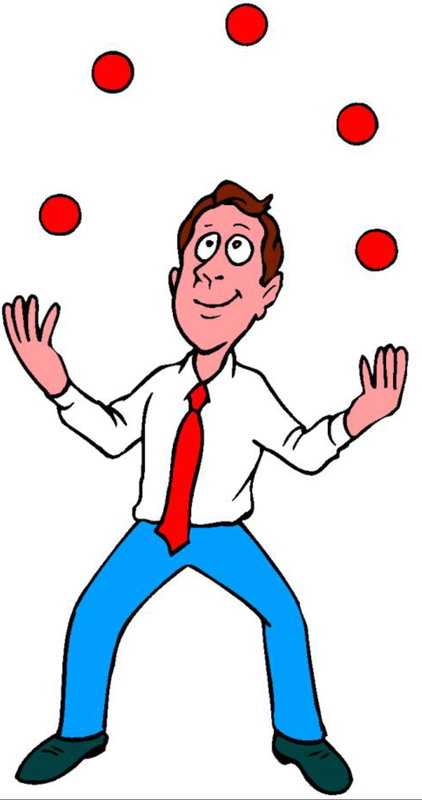 Does it sometimes feel like you are juggling your life’s tasks and you simply can’t keep up? It’s easy to feel this way. (1) What are some of the things you do to help you keep all of the balls in the air? (2) What are some of the things that seem to really mess you up? (3) What are some of the things we can do to become “better” jugglers? Regarding the first question, I’ll confess that I’m not an expert at this. Even though it sounds a bit cliché, one thing that helps me keep all of the balls in the air is keeping my eyes on the ball. Or, as is usually the case, I’ve really got to concentrate on keeping my eyes on the balls. Something that goes hand-in-glove with this is having the ability to let go. I’ve come to realize over time that I’m more of an idea guy. I believe it’s a gift from God. But, although I’m reasonably adept at developing processes by which ideas can be implemented and managed, I’m not the best detail person. I’m very thankful that God has placed some extraordinarily talented detail people in my life. What are some of the things you do to help you keep all of the balls in the air? With respect to question two, some of the things that really mess me up are: 1) failure to prioritize—sometimes the urgent crowds out the important in my life; 2) over committing myself—sometimes I bite off more than I can chew and everything suffers; and 3) forgetting to breath. Back in the day when I played the baritone saxophone I would sometimes try to play through longer than my breath would take me, thinking this showcased my talent. Instead, it adversely affected my sound. I was so enamored with myself for doing without air that I didn’t even notice. Mrs. Hadley did, though. She would wave her hands about her head like she was fighting off an attack of killer bees. Then with crisp, staccato strikes on her music stand with her baton she would emphasize each syllable while she said, “You gotta’ remember to breathe, people!” Then, so that I would feel the full intensity and blazing heat of her stare, she would look directly at me and say, “You must breathe!” Even though she was only 5 feet tall, I knew it took every ounce of strength she could muster to keep from thrashing me. Well, that’s a long story to make a short point. Busyness is often confused with productivity. Sometimes, the best thing we can do to become better jugglers is to put down our tasks and take a few minutes or days and just breathe. What are some of the things that seem to really mess you up? What are some of the things we can do to become “better” jugglers? So, what about you? Are you struggling with your juggling? If so, I hope these thoughts are helpful. If you you have help advice on this topic we would love for you to share it!